Rachel J. Franz, MEd, is the Director of Education and founding Lead Teacher at Tiny Trees Preschool. She is a founding member of NAEYC’s Young Professionals Advisory Council (YPAC). It’s midweek at a park on Beacon Hill, in Seattle’s south end. It’s rainy, and only a few brave walkers are out, wearing raincoats and bending their heads low against the wind. But if you peek through a small patch of trees in the corner of the park, there, with no buildings or walls, is a preschool. Tiny Trees Preschool is just one of many all-outdoor preschools in Washington State. 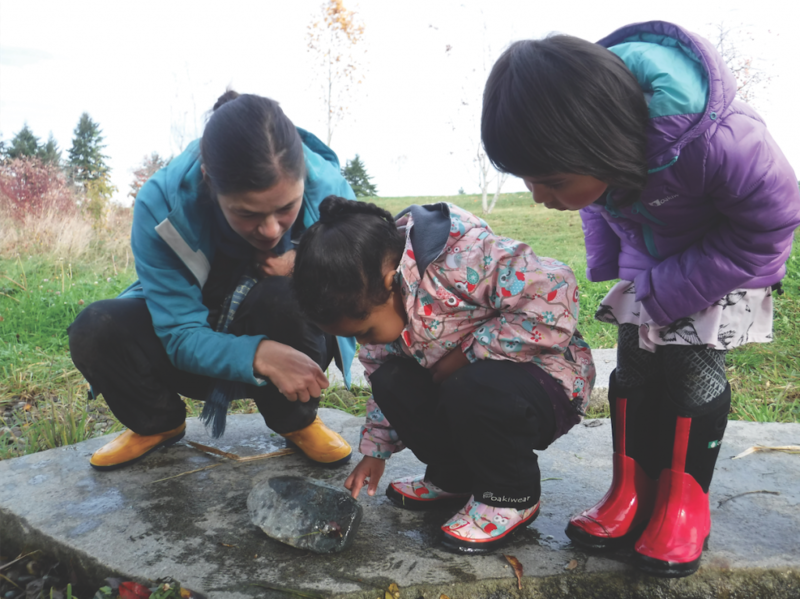 Each morning, children from ages 3 to 5 come to a tiny corner of a public park—rain or shine. It’s a space populated with log circles, stumps, and storage for materials for outdoor play, learning, and exploration. Some of these materials include traditional arts tools like scissors, paint, and paper. We also include outdoor tools like binoculars, wheelbarrows, and hammers to add to the possibilities for exploration. Schools like Tiny Trees that offer place-based education rely on the surrounding landscape to teach life skills, such as staying warm and contributing to the community. 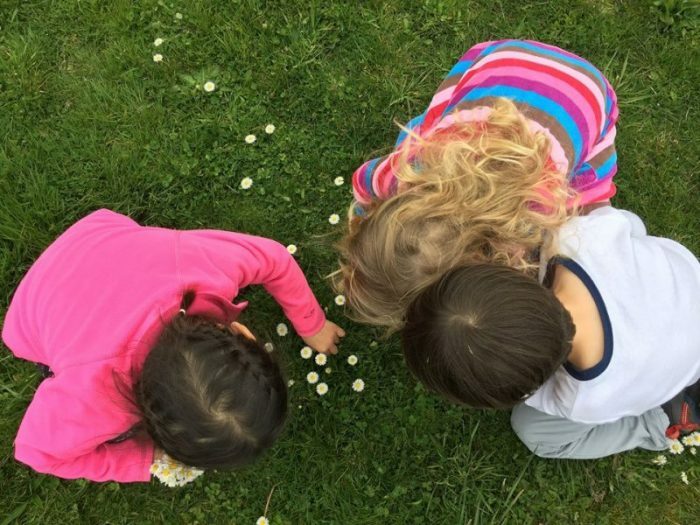 They are intertwined with outdoor activities that address preschool content standards, like counting, alphabet recognition, and spatial awareness. Educators can use aspects of a program’s site—urban, suburban, or rural—to inspire the curriculum and to launch learning projects that follow the children’s interests. At Tiny Trees, we engage in place-based education mainly by focusing on outdoor experiences; this could include studying fish at a park where salmon spawn in a nearby stream or experimenting with angles and inclines at a local skate park. As my colleagues and I have learned at Tiny Trees, moving beyond the walls of a classroom can be tricky. Obstacles include weather, access to outdoor space, safety worries about strangers or wildlife, and the teacher’s comfort level with nature and the outdoors. Educators can find opportunities for teaching everywhere and in almost any weather, but it does take intention, effort, and persistence. In this article, you will find activity ideas and learning opportunities for math, science, and literacy, and some tips for getting started! Children learn best when they experience new concepts in familiar contexts. For example, children are more motivated to recognize numerals (or number symbols) when they relate to their daily lives and experiences—such as identifying the numbers on a neighbor’s apartment door or examining prices on items in the grocery store. Giant dice: A set of giant dice is useful when helping children learn to associate numbers with quantities. A fun game to play in the park is to roll the dice and find the same number of objects nearby, such as six stepping stones in a path or four birds on a telephone wire. As children further develop their concept of numeracy, they can look for numerals in the environment, such as on signs or license plates. Ecology: One feature in our urban park is storm drains. For children, storm drains hold a lot of mystery. One day, the children in our program noticed that things had been dropped into the storm drain. We discussed the impact this has on our watershed, and the children— adamant that they would help keep the water clean by catching lost objects—decided to create fishing rods out of sticks and string. It was a fantastic cooperative play opportunity for the group: they came together to practice problem solving, turn taking, and sharing space, as well as to learn about environmental stewardship. Physics: Another surprising outdoor learning activity was a visit to a skate park, which is fairly empty during school hours. It provided amazing opportunities for using spatial vocabulary (up, down, around, sideways, diagonal) and for talking about speed (“Wow! That ball moved even faster down this side!”), inclines and angles (“Which side is the steepest?”), and other physics-related topics. Children explored the skate park with their bodies and with balls, acorns, and other items that roll and move in different ways. Getting Preschoolers Outdoors: Where to Start? Need some help getting started with place-based education? Here are some ideas. Identify the parks and outdoor spaces that the children’s families frequently visit. Plan trips to those spaces, if possible. Explore the school’s neighborhood together and help the children create a neighborhood map. Think beyond the playground. While parks are often attractive to families because many have playgrounds, they have much more to offer in the natural spaces beyond the playground. At Tiny Trees, teachers are discouraged from taking children to the playground. Instead, we use natural areas and neighborhood resources to engage in math, science, and literacy explorations. Can you write in the rain? 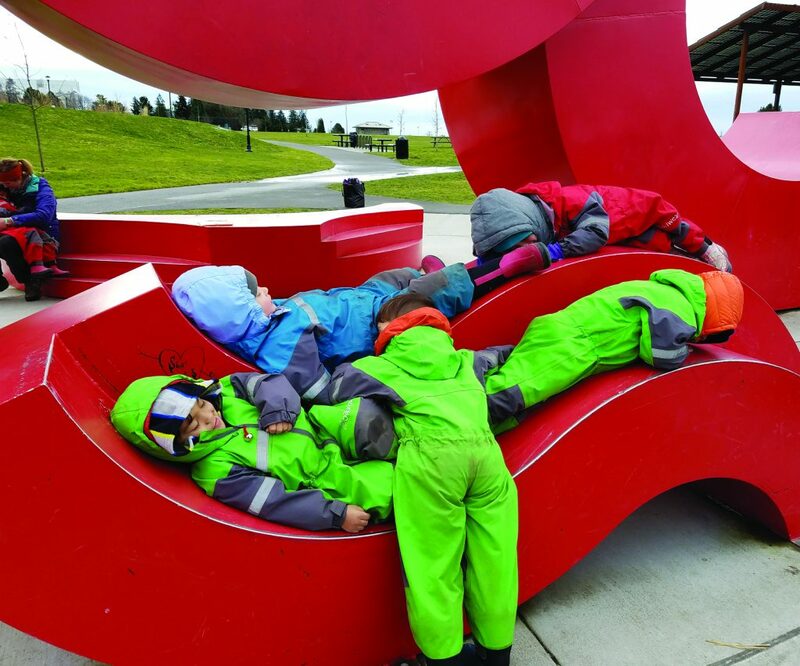 Outdoor preschools show that learning outside is possible even in sloppy weather. Think outside the box: writing doesn’t need to rely on pencils and paper. Instead, children can write with water or sticks in mud, gravel, and snow. We have even used water to write on the sidewalk! Children can also form letters using twine, twigs, and objects found in nature. Children deserve to have the kinds of childhoods that many of us look back on fondly—full of connections to their neighborhoods and outdoor experiences that get them excited about learning, no matter where they live. Educators can feel empowered to get children outdoors and into the world around them. Children, in turn, can find learning opportunities wherever they go—even in their neighborhood park! This article was published in the NAEYC magazine Teaching Young Children,April/May 2019 Vol. 12, No. 4 linked here.